Fitness trackers represent great gadgets for those who want to get more out of their daily fitness activities. In the beginning, those gadgets were used for simple functions like step tracking, which isn’t really that useful compared to some advanced functions that modern fitness trackers offer. Nowadays, there are many fitness trackers that offer functions like monitoring heart rate, sedentary warnings, and sleep trackers. These factors are very important for your overall health and balanced lifestyle, so fitness trackers can be very useful if done right. 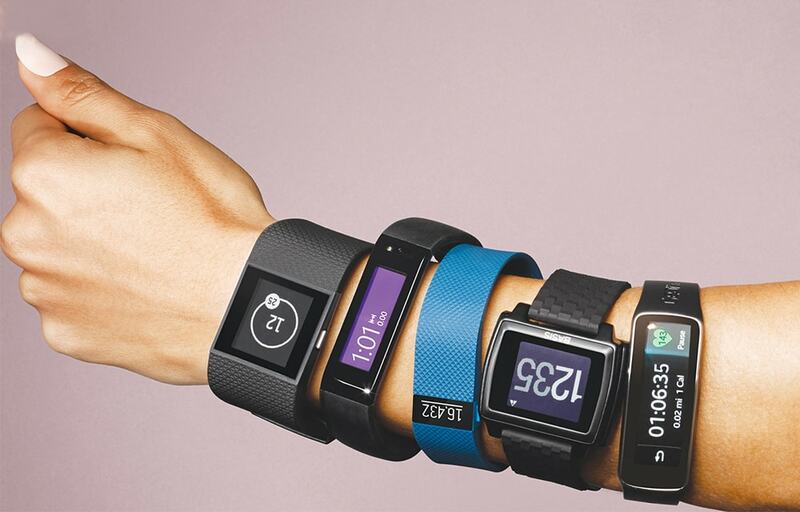 Today, we are going to count down 10 best wearable fitness trackers in our opinion. Garmin Vivoactive HR is a great wearable fitness tracker which offers a lot of possibilities aside from classic tracker options. Although it’s a little bulky, depending on person’s taste and preference, it’s very comfortable to wear. Now, about possibilities. It can track your activity throughout the whole day, from day to night and has a great function called phone notifications. Of course, a heart-rate sensor is inevitable and works great here along with GPS function for easier tracking of your footsteps or running distance. However, this comes at a price starting a little over 200$, but it’s well worth it. Fitbit Charge 2 boasts a slim, lightweight design good for those with smaller wrists. It’s a little cheaper than the previous fitness tracker on our list but is nevertheless a great tracker. First, there are a step and sleep tracking and continuous heart rate measuring even in rest. With the newest update to Fitbit Charge 2 software, you can now track various stages of sleep, to be more informed about your quality of sleep and rest. GPS function is also available here but is connected to your smartphone, so you’ll need to carry both gadgets. This one sits between the first two trackers on our list in terms of the price tag but isn’t waterproof, unfortunately. It has a great, big display with high density and is very readable in all weather and light conditions. This may be a downside for somebody, but we actually like its robustness and functionality. Standard features are available here, from measuring heart rate to step and sleep tracking with built-in GPS. Battery life is great and manages to hit even four plus days. Overall, a great fitness tracker with nice, stylish design. Fitbit Alta HR comes from a very popular brand Dell. This one is actually very affordable, with its price tag just above 100$. It’s slim and very nice-looking fitness tracker with lots of possibilities. Here, the focus is on controlling your sleep and measure time you’ve spent awake. Sleep monitoring is detailed here, with all the details about your sleep from REM stage to light sleep, informing you of your sleep quality. However, GPS isn’t available here, along with workout mode, but it still manages to automatically detect exercises, making it great for fitness classes. Nokia is determined to give the best monitoring of your heart with Steel HR fitness tracker. As we mentioned, Steel HR is great when it comes to monitoring your heart rate, with some of the detailed info we’ve seen on a fitness tracker. It has an elegant design and is made of steel; a robust and endurable tracker. Aside from sleep and step monitoring, this tracker can count calories accurately, helping you keep track of your diet. Let’s start with the design of Garmin Vivosmart 3. Surely, it isn’t the prettiest fitness tracker you can find, with it’s rubbery and monochromatic display, but hey, it packs quite a punch and looks really discreet, almost like you wear nothing on your wrist. Feature-wise, there is a heart monitoring system, which monitors your bpm 24/7, along with features like rep counter for those who like to lift weights and automatic exercise tracking. These features work well and make up for the lack of GPS support. The most expensive tracker on our list- Garmin Forerunner 235 is great for those who like running. A beautiful design and water resistance capability, it’s great for everyday use even when you are swimming or showering. It has accurate GPS for tracking your movement and 24/7 heart rate monitor capability. If connected to iPhone or Android, it can show you notifications, which is great if you are not close to your phone at the moment. Sleep and step monitoring are also included here and you really get what you pay for, although we’d like the price to drop a little bit. Fitbit Flex 2 is a more simplified version of fitness tracker thus also being one of the cheapest. Nevertheless, for the sub-hundred dollar price tag, you can get a decent fitness tracker that can monitor basic fitness data like steps and sleep. However, it lacks any kind of display and even heart rate tracking but is waterproof. Good for non-demanding users. This fitness tracker looks like a stylish watch which you can wear at any moment, even at a wedding and other similar occasions. However, it’s cheap thus not being the most advanced fitness tracker here. Sure, it has some basic features, it’s waterproof and is able to connect with iOS or Android, but lacks functions like heart rate monitoring, GPS, vibration and smartphone alerts. But hey, for less than hundred dollars, you get a pretty decent watch and fitness tracker. Much similar to the previous two trackers, Misfit Ray boasts a sleek and modern design, with basic functions like step and sleep monitoring, It can measure walked distance, count your steps and estimate how much calories you’ve burned. However, advanced features like GPS and heart rate monitoring aren’t available which is really a shame for this sleek and streamlined tracker. It also stands in the sub-hundred dollars price tag, which in our opinion, is a right price for this fitness tracker. You simply can’t go wrong if you decide for Misfit Ray.